NOTE: Wall Charts are currently back in stock, here and on Amazon. We are doing short print runs, please order while supplies last! Check out Jack’s cozy Bass Corner in Ohio! An inviting music corner in Tel Aviv. Also featuring Ari’s Course matrix! Thank you for the picture, Uzi! An 18 by 27 inch visual reminder of important music theory basics! 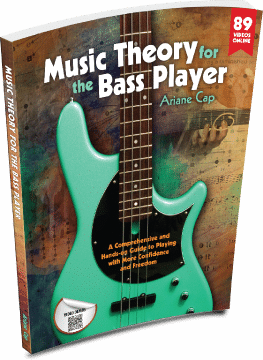 Music theory needs hands-on practicing just like everything else. Just knowing and understanding it “in theory” is not enough. Having shapes under your fingers to use them in a musical situation effectively is where it’s at. To help keep the most important points to remember fresh in your mind, hang this comprehensive and clever wall chart in your practice room: it arranges the most important building blocks of music in a visually appealing and easy-to-grasp chart, with reference to the fretboard. Click here for Tips and Tutorials! Save on shipping in Europe by ordering from Paul’s Bass Matters in Nijmegen, who will send you the cool tube directly from the Netherlands! The wall chart is also available at Die Klangfarbe in Vienna, Austria. The rate for your country is calculated at check out. One more thing, international friends, just a heads up: your taxman may come a’knockin’ for local taxes or fees (VAT, Zoll etc). This is country specific and the responsibility of the buyer. Please double check that your address is correct on PayPal. That really helps us get the wall chart to your door! Suite numbers, alternate names on the door, new zip codes… please make sure it all is A-OK. Happy walls in Costa Rica, Germany, Arizona, LA and London! Thanks to Alex, Larry, Chris, Kevin, Swanelder, Barry, Pim and Glen!